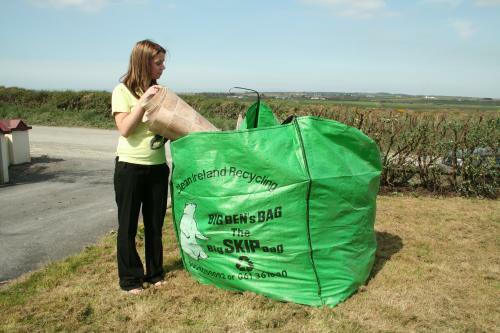 “Big Ben’s Bag” from Clean Ireland Recycling offers a low-cost alternative to conventional mini skips. It comes neatly packaged in a small plastic bag that can be obtained from any of our offices. Clean Ireland Recycling uses specially designed trucks with long reach cranes offering much more flexibility to you the customer. 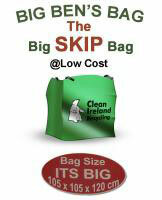 “Big Ben’s Bags” are available for FREE in any of our offices in Ennis, Limerick, Shannon or Cree. If you already have a “Big Ben’s Bag”, please complete the order form and we will arrange collection within 7 days. When you receive your “Big Ben’s Bag”, please be sure to read all the instructions prior to filling. Please note this option is for collection of the bag only once you have it ready for collection. You do not need to pay for the bag until you have it full and ready for collection. To request the collection of your Big Ben’s Bag and enable you to pay for your bag online, please select the [Order Now] button below.